Lieutenant Cyril William Winterbotham (Gloucestershire Regiment) is killed in action during an attack on the German positions near Mouquet Farm at age 28. He is a war poet. “The Christ is born again”. With us on Christmas day. Captain Henry Cullen Gouldsbury (East African Unattached List attached King’s African Rifles) dies in Tanga at age 35. He is a novelist of Circe’s Garden and God’s Outpost and and the author of the classic ethnological work The Great Plateau of Northern Rhodesia. Lieutenant Geoffrey Reynolds Day (Bedfordshire Regiment attached Warwickshire Regiment) is killed at age 28. He is the son of the Reverend Archibald Day Vicar of Malvern Link. Lieutenant Geoffrey Reynolds Day (Bedfordshire Regiment attached Warwickshire Regiment) is killed in action at age 28. He is the son of the Reverend Archibald Day of the Vicarage, Malvern Link. He was a Fellow of Emmanuel College, Cambridge. Second Lieutenant William Cargill Stuart Macfarlane (Argyll and Sutherland Highlanders) is killed at age 19. He is the son of the Reverend A Macfarlane. Second Lieutenant Reginald Fitzroy Talbot (Royal Flying Corps) is killed at age 29. His brother will be killed in August 1918 and they are grandsons of Rear Admiral ‘Sir’ Charles Talbot. 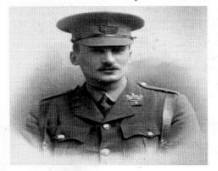 Second Lieutenant Charles Francis Cockfield (Royal Garrison Artillery) is killed in action. He is the father of the Right Honorable Francis Arthur Cockfield Baron Cockfield who will be born after his father’s death. Second Lieutenant Gordon Amhurst Forsyth (Royal Fusiliers) is killed by a trench mortar bomb at age 28. His brother will be killed in August 1918. Private Alfred James Redfern (South Wales Borderers) is killed at age 23. His brother was killed in June 1915. Private William Young VC (East Lancashire Regiment) dies following an operation at home at age 40. He was awarded the Victoria Cross for efforts last 22nd December in which he was wounded and sent home. He spent four months in hospital and was well enough to attend a civic reception in his honor in Preston in April. He went into Cambridge Hospital, Aldershot, for a final operation in August, but he never recovered consciousness; the anesthetic caused his heart to fail.